Dounia and her best friend, Maimouna, dream of becoming millionaires. However, life in a Parisian ghetto offers the feisty pair few opportunities and little hope for the future. One of their only pleasures comes from sneaking into a nearby theatre and secretly watching the dancers rehearse. One dancer in particular, a young man called Djigui, catches Dounia’s eye and offers the possibility of a life-changing love. However, desperate for change and seduced by money, Dounia decides to follow in the footsteps of local drug dealer Rebecca - with devastating results. Click Here For Weekly Reviews, News & Cinema Events! Houda Benyamina’s debut feature, Divines, features a truly joyous depiction of young, female friendship. Comparisons have been made to pairings as diverse as Laurel and Hardy and Thelma and Louise. For her part, Benyamina wanted to recreate a special friendship from her youth. Whatever the inspiration, Dounia and Maimouna’s powerful relationship is the beating heart of Divines. Superbly portrayed by Oulaya Amamra and Déborah Lukumuena, they engage us within minutes. You can’t help but fall in love them both, even when they make terrible mistakes. Dounia and Maimouna are an entertaining force to be reckoned with - making us smile, while breaking our hearts. Inspired by the pent up frustration felt at the time of 2005’s riots in Paris, Benyamina decided to make a film about the disillusionment of the City’s struggling underclass. However, while imbuing her social realist story with urban grit, the director also wanted to make an enjoyable and accessible movie. Divines succeeds in bridging the gap between relevant contemporary commentary and entertaining, suspenseful drama. It is full of fun cinematic references and includes imaginative and magical scenes. This film is also an extremely emotional ride. Dounia and Maimouna’s antics are hilarious and heartwarming. Meanwhile, Dounia’s tentative relationship with Djigui is really quite beautiful. Benyamina displays the female gaze (via both Dounia and Maimouna) in her story - something still all too rare in film today. However, Divines also possesses a darker, violent side. Benyamina is unafraid to take us to some disturbing and, ultimately, heartbreaking places. Several scenes in the film are a tough watch. Benyamina. I can’t wait for the next film from this exciting new director. Divines won the Golden Camera award at Cannes this year. This award recognises the best first feature film presented in one of the Cannes' selections (Official Selection, Directors' Fortnight or International Critics' Week). Houda Benyamina has spoken of her reluctance in casting her younger sister in the role of Dounia. In an interview with Sight & Sound magazine, she explains that she “didn’t feel she was right for the role… She’s very feminine, very sensitive and she didn’t have this tough exterior that Dounia should have… But she really proved herself”. 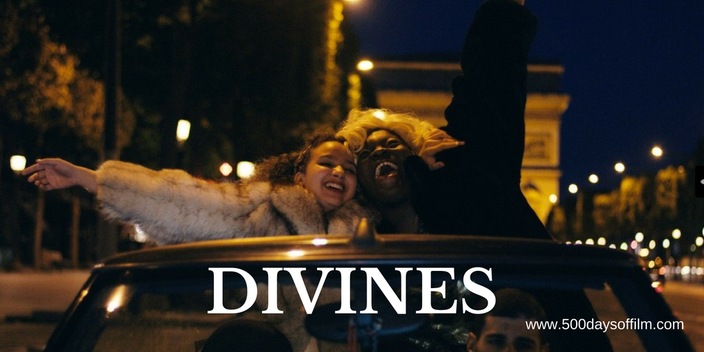 Divines has been released via Netflix, a move that concerned Houda Benyamina at first. However, in the Sight & Sound interview, she explains that Netflix has allowed “a real democratization of film. It’s made it accessible, especially to young people who only really watch their films on tablets or on their phones. And also cinema tends to be quite expensive - I feel it gives people the opportunity to see these films”. This movie absolutely blew me away, I loved everything about it. It made me laugh, terrified me, gutted me. I fell for those two leads, they were absolutely amazing. Hi Em, I am so glad that you loved Divines as much as I did! I need to watch this film again soon! Happy New Year!